Even when the outcome is a foregone conclusion, every major project transporation seeking federal funding needs to perform an environmental impact report. As part of the EIR process, multiple alternatives are studied to address the purpose and need statement; most alternatives are practical, others… not so much. The Forest Park Ave busway is of the latter variety. 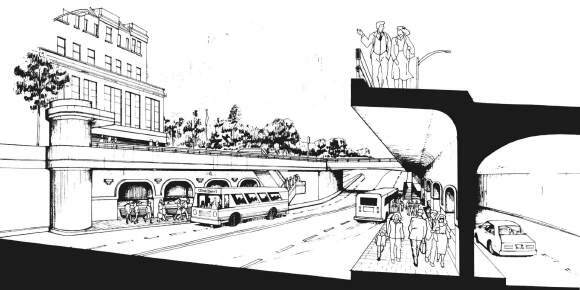 The drawings above and below come from a 1984 draft environmental impact study for what would become the St. Louis MetroLink system. The busway alternative ran from the airport to downtown via I-170 and Forest Park Pkwy with stations spread out along the way. While plans for the busway west of Kingshighway seem practical, published plans for the busway along Forest Park Ave are surprisingly bizarre. At both Kingshighway and Grand, the busway would take over the normal travel lanes. Through lanes for vehicles would be built underneath the entrance and exit ramps to Kingshighway and Grand. Meanwhile, busway stations would be built in the narrow gap between the car lanes and bus lanes. In addition to utilizing the Forest Park Ave underpasses at Kingshighway and Grand, overpasses were to be built at Taylor and Vandeventer to maintain high operational speeds for buses and would have essentially turned Forest Park Ave into an expressway.